Check out the links and grab yourself a bargain ebook! My ideas come from anything and everything around me. A chance remark overheard on a train or at the bus stop. A picture on a wall that makes me ask myself a question, the ensuing answer often being an idea that I can run with for a story or a story arc in one of my novels. My ideas come at any time of the day, but most often when I'm undertaking menial tasks such as peeling vegetables for lunch, ironing, cleaning the bathroom or vacuuming the carpets. Such tasks require little or no intellectual input and I'm afraid my brain just has to find something to keep itself occupied. A great many of my ideas spring up at such times. But that's not all. Things I experience also become ideas. For example, whilst I was visiting the Cévennes in September 2007, the weather changed overnight and I awoke the next morning, September 29th, to snow and a pristine and white landscape. It was whilst I was watching the flakes of snow twirling past the window that it occurred to me that if someone had some terrible misdeed to hide, snow could be very useful. 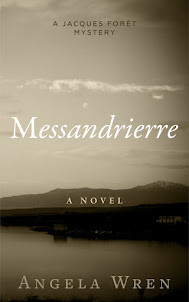 Later that morning, the opening lines of Messandrierre were crafted and a rough outline for a story was formed and jotted down in my notebook. From that idea to finished book took a lot more thinking and a great deal of hard work. In my current book, Montbel, the weather also plays a part. Jacques and Beth are discussing their future plans and I decided that it might bring a note of doubt into the reader's mind if the conversation was brought to an abrupt end because of the weather. The storm that is described in that scene was yet another experience from my time in the Cévennes in 2017. So, it's true my ideas really do come from anything and everything around me. the sketchiness began to become more defined. I realised that Miss M had her own magic, that she was timeless, that she behaved impeccably and had her own style. Through our discussions and supporting email exchanges I understood that she was all things to all people and she became the person she needed to be for each of the stories in the anthology. So much about writing is solitary and those lunches with my fellow authors gave me the confidence to venture into a completely different genre from the one I normally write. It was a wonderful opportunity to work collaboratively for a change. And I think that, perhaps, Miss Moonshine's magic might also have been at work, too. …Camped in Saverne and weather really hot and sunny again. 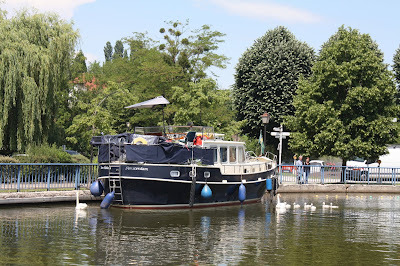 …the marina behind the chateau is part of the Marne au Rhin canal which stretches from Vitry-le-François (in the département of Marne, 51) in the west to Strasbourg (in the département of Bas-Rhin, 67) in the east, passing through Saverne on its way. The distance is a little over 300Ks which is almost 200 miles. 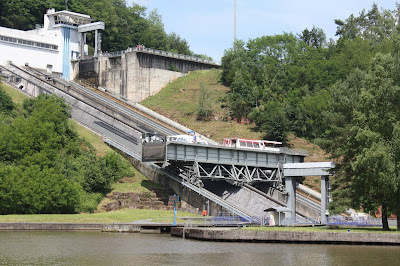 The canal crosses through 5 départements, traverses the Vosges mountains too, and originally had 178 locks along its route. That's quite a chunk of the country when you consider that construction began in the 1830's and the canal was not completed until some 15 years later. However, it linked two massive rivers and provided a large port and trading route to Germany. 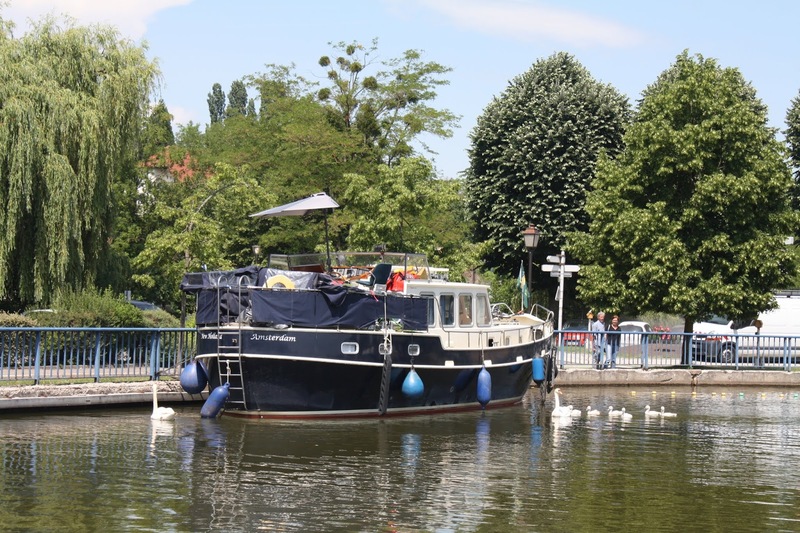 When it opened in 1853 it took the title of being the longest canal in Fance. I cycled from Saverne to the St Louis-Arzviller Plan Incliné and the route along the canal - which is about 15Ks each way - is fairly smooth and mostly tarmac. Stopped off in Lutzelbourg to have a look around - not that much to see - and buy a cake for lunch. Then the last few kilometres to the Plan Incliné. The boat lift replaces the ladder of 17 locks that were needed to climb the eastern side of the Vosges. Originally that one section of the canal would take a whole day for the barges to move through. The current boat lift takes about 5 minutes and moves the barges through a differential in height of 45m - that's about 140ft. In the shade at one of the picnic tables I had my lunch. The barges being moved between the two levels of the canal provided my entertainment. I never thought I would find a mobile piece of concrete so entertaining. But that boat Iift - it's quite a sight! 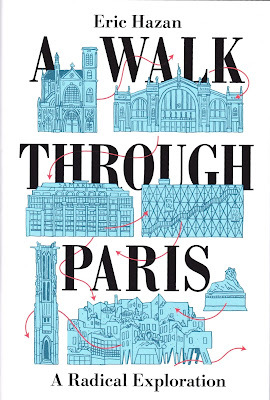 A Parisian by birth, Eric Hazan has lived in the city all his life. He is the founder of the publishing house, La Fabrique, and is the author of several books about Paris, France and its history. He has also worked as a surgeon and is well known for his opinions on Parisian society. When I happened upon this little tome in a bookshop whilst visiting a nearby town in North Yorkshire, I just could not let it remain there unread. It came home with me and I am very glad that it did. Beginning at a bookshop - a most suitable place to start in my opinion - he charts his trail across the city from south to north. Of course, were I to be in Paris now, my route would be significantly delayed whilst I browsed through the shelves of books. I have probably spent half my life in bookshops already! This particular bookshop in Ivry is one I have yet to visit. It sits on rue Gabriel Péri and the opening hours are somewhat flexible. As Hazan meanders through the streets and squares he shares with you little pieces of history about his surroundings. He makes comments on the buildings, the architecture and, in some instances, even provides you with a potted history relating to how and why a specific building is there. His wit shines through in his anecdotes and asides as he guides you across the city, and that's not always in a straight line either. There are plenty of little detours and side streets to explore. City guides and green guides are all well and good and very informative, but they only ever take you to where every other tourist goes. 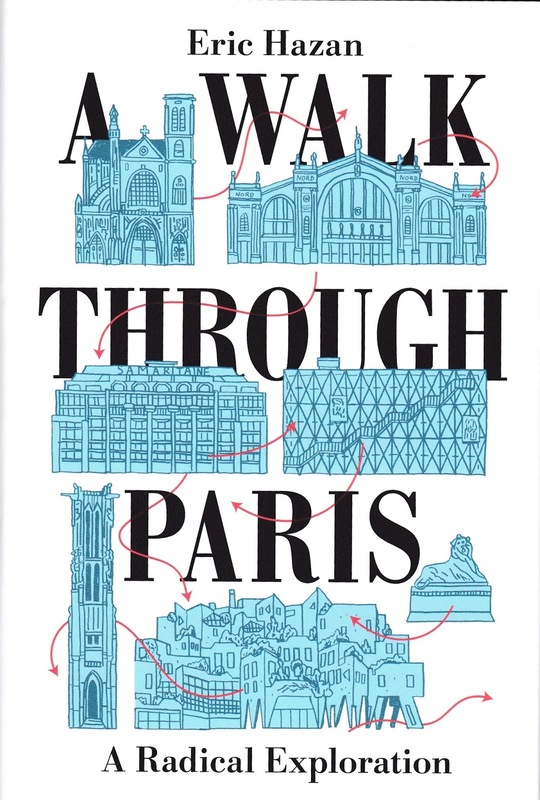 This book takes you to the Parisians' city, to the places that only someone who has spent a lifetime in Paris would know. A brilliant little book with a gently flowing narrative voice and it will be coming with me when I next visit. ...to my blog this week. Hi, Samantha, thanks for making time in your busy schedule to be here. So, tell me what is is your current release? SP My latest book is a novel, Rose Villa, about a cursed house. AW Hmmm... That sounds interesating. What first got you into writing and why? SP I wanted to write from a young age, but I didn’t think it was something normal people could do. Then when I left school I went to work for a large bookshop. We had authors coming in to do signings and I realised many of them (not all of them) were actually normal people. When I left work to have my babies I thought, it’s now or never. It’s hard to say what first got me into writing though, I read a lot as a teenager and just knew that’s what I wanted to do. AW You write mystery and contemporary novels. Is it all imagination or do you also undertake research? SP It’s mostly research! I try to check everything to make sure I’m getting it right, especially when writing about the past and I do a lot of research before I start. Imagination comes into it too, of course. I’m writing my first non fiction book at the moment and I’ve found the level of research needed for that to be so enjoyable, though probably because it’s such an interesting and gruesome subject! AW And what about other types of writing? Have you ever dabbled with short stories, for instance, or other genres? 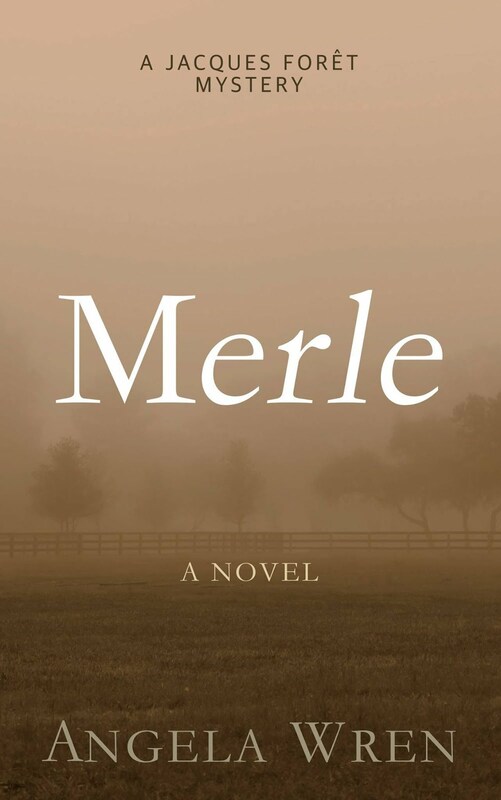 SP I started out writing short stories and my first novel began as a short story. I also have two short fiction chapbooks published. I’ve also written two plays, both of which are being staged this year. AW Famous authors, such as Roald Dahl and Dylan Thomas, had a special space for writing. Do you have a writing ‘shed’ of your own? 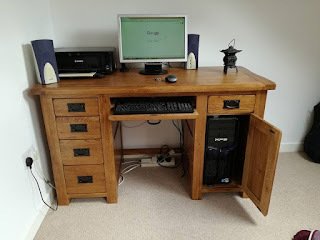 SP We moved house almost two years ago and for the first time ever I now have an office! It’s a small attic space. I love having somewhere that’s just for writing, it makes it so much easier to concentrate! AW Finally, what would your eight-year old self think of, and say about, you today? SP I think my eight year old self would look at me and say this is exactly who she’d expect me to be! I feel so blessed to have been able to make the life I wanted to have. I’m not going to say ‘lucky’ because it’s been hard work and a lot of patience, but my eight year old self would see the me today as being who she wants to be. ... about the book Rose Villa has held a curse in its bricks since 1843, and the Yorkshire village it stands in has held the secret of a murder since 1987. In 2007, Jonathan and Kirsty meet on Facebook twenty years after they last saw each other and Kirsty visits Jonathan in his home, Rose Villa, only to find the house has affected him and he’s no longer the person she once knew. ... about the author Samantha is a writer based in Sheffield, England. 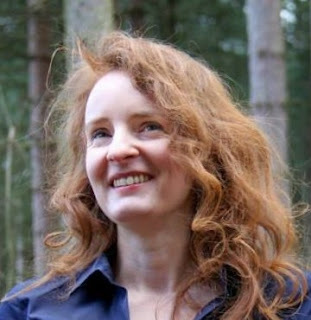 She won the H. E. Bates competition and The Tacchi-Morris Prize for short stories. Her chapbooks, Dreamers and Orange Balloon, are published by Folded Word. 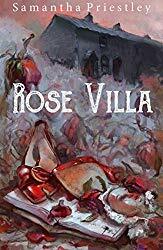 Her novels Reliability of Rope and A Bad Winter, are published by Armley Press and her latest novel, Rose Villa, is published by ASJ. She has also written two plays, Greenwood and The Devil is in the Timing, to be staged this year. MH Writing. A lonely profession, stuck at a desk for hours at a time writing, researching, thinking. Getting those words down, then rearranging them, editing. So why do we do it? For the joy – the hope – of creating something beautiful, of course. I love every single book I have ever written. They may not be to everyone’s taste, or huge bestsellers, some of them have not even found a publisher (yet) but they are my creations and I wrote them with blood, sweat and tears. With love. I love the new things I learn with each one, little snippets of history, of the world, I love the way the characters and the stories never cease to surprise me. One of my earlier books, Lucasta, started life when I read a poem by Richard Lovelace, To Lucasta, Going to the Wars. Lucasta – a wonderful name for a heroine. It did not take long to create an adventure set in Georgian England, involving a cross dressing heroine with a very practical nature, a heroic viscount, a dastardly villain and even a cheese shop! One of the biggest surprises has been Miss Moonshine, a character created “by committee”, as it were. You see, there were nine of us, all authors, meeting for lunch in the beautiful Pennine town of Hebden Bridge and we decided we would write a book of short stories (why not? After all, we all had busy writing lives, why not add extra work!). But we needed a common thread. Deciding to base our stories in a fictionalised town based on Hebden Bridge was easy, but from somewhere a character appeared, a rather other-worldly creature who would appear in each of our stories. Some of us are historical novelists and wanted to write stories based in the past. That wouldn’t be a problem. Miss Moonshine is ageless, it seems. 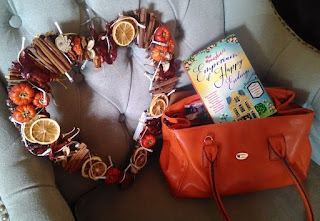 In Miss Moonshine’s Emporium of Happy Endings we see her first in my own story, set just after the battle of Waterloo. Then she appears again in the Edwardian era, and on into the present day. Logic tells us she can’t be the same woman. Can she? Ask any of the authors involved and we will all just shrug. I don’t think any of us knows quite where Miss Moonshine came from. That’s the magic of creation. AW I couldn't agree more! MH My current novel is set in Northumberland and involved more “loneliness” than just the writing of it: a huge expanse of deserted beach in Northumberland, and castle ruins, visited out of season and therefore empty, but what was born from that journey was a tale full of life and action. 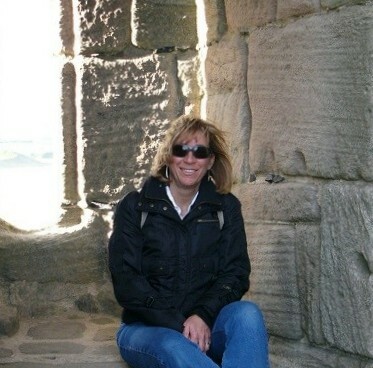 When I first visited Dunstanburgh Castle I thought I would write something set in the middle ages, but what my somewhat fevered imagination conjured up was very different. 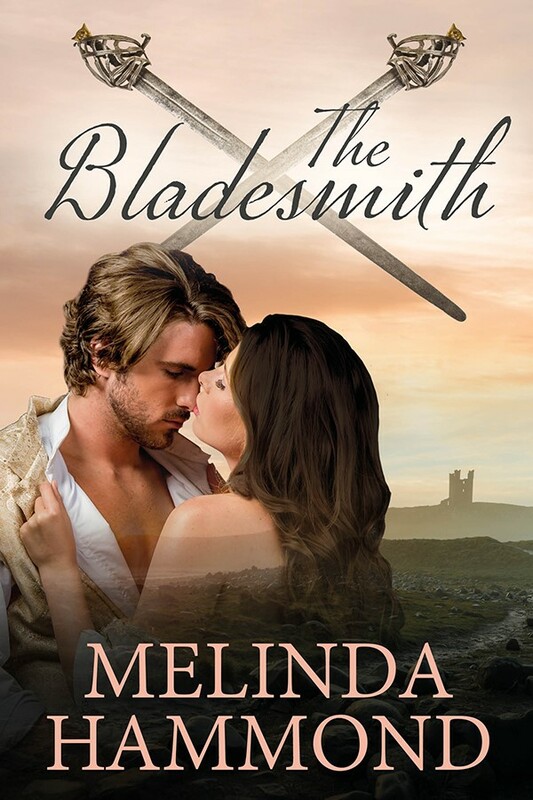 A story set in 1745, a young sword maker who finds himself caught up in a desperate battle to save his family’s honour, and the woman he loves. It has all the things I most love in a book, action, romance and history! AW I've walked along that beach many times and I've even got the same shot! 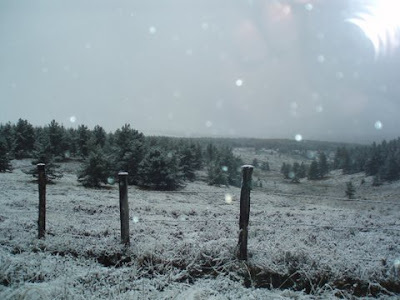 Last time I was there everything was covered in snow. MH So, thank you for allowing me to leave my desk for a short time, but I really must get back to it. 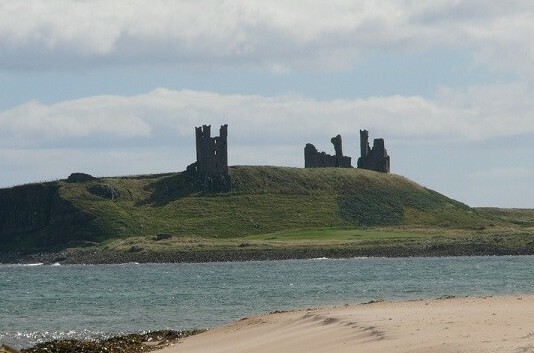 Words are calling…..
about the book... Blurb: 1745: John Steel takes a consignment of swords to Warenford Keep on the wild Northumberland coast. He suspects that the swords are destined for the rebel army of Charles Edward Stuart, but matters are complicated by his growing attraction to Katherine Ellingham, daughter of a known Jacobite and betrothed to the powerful Lord Warenford. 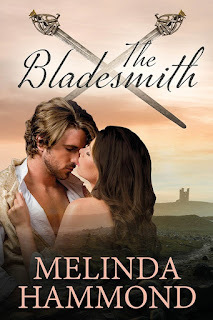 about the author... Melinda Hammond is an award-winning author of historical adventures and romances. She also writes historical romance for Halrequin Mills & Boon as Sarah Mallory. 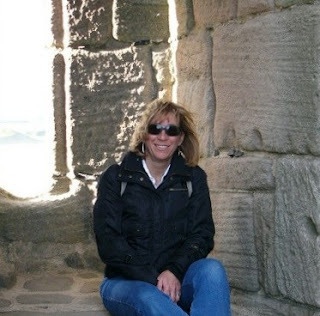 Until recently Melinda lived on the Pennines, drawing inspiration from the glorious scenery, but recently she ran away to Scotland, to embark on a whole new adventure! 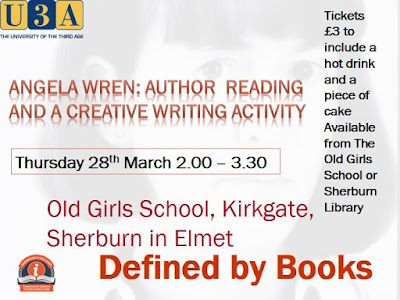 I've been invited to speak at Sherburn-in-Elmet Old Girls' School on Thursday March 28th at 2.00pm. As my life seems to have been all about books - either as a reader, a student, a researcher, a collector and now as a writer - I thought the subject of books would make an excellent topic for my talk. But, don't worry I won't be hogging all of the limelight. 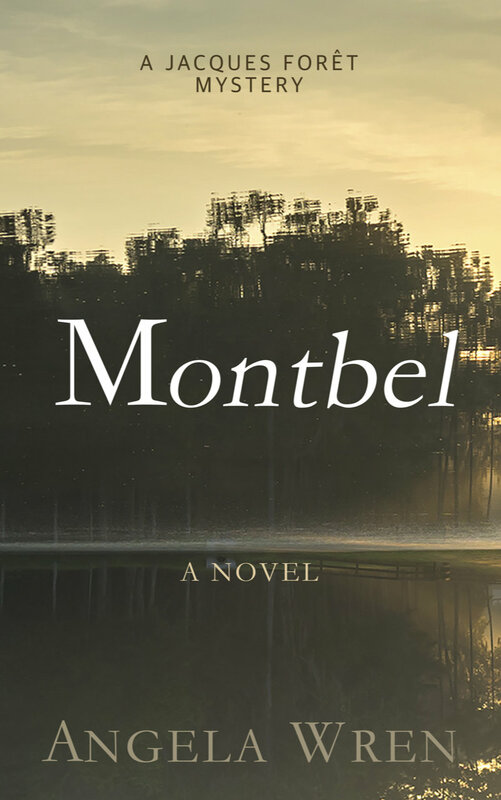 I will be letting some of my characters take centre stage as I will be reading from my latest novel, Montbel. There will be plenty of time for questions and I will be allotting some time to a short wrting workshop. In addition, tea and cakes will be available all. Tickets for the event are for the event are at the very reasonable price of £3.00. 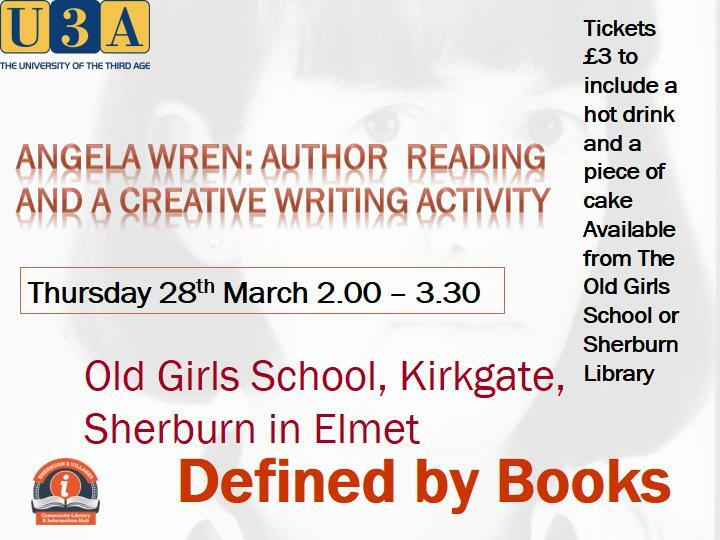 Please make sure you book your place through Sherburn Library on 01609 5360330 or through the Old Girls' School on 01977 685178. I will have a supply of books with me and they will be on sale during the course of the afternoon. I hope you can join myself and Ellen Schofield - the organiser - on March 28th. I can promise you a fun afternoon! 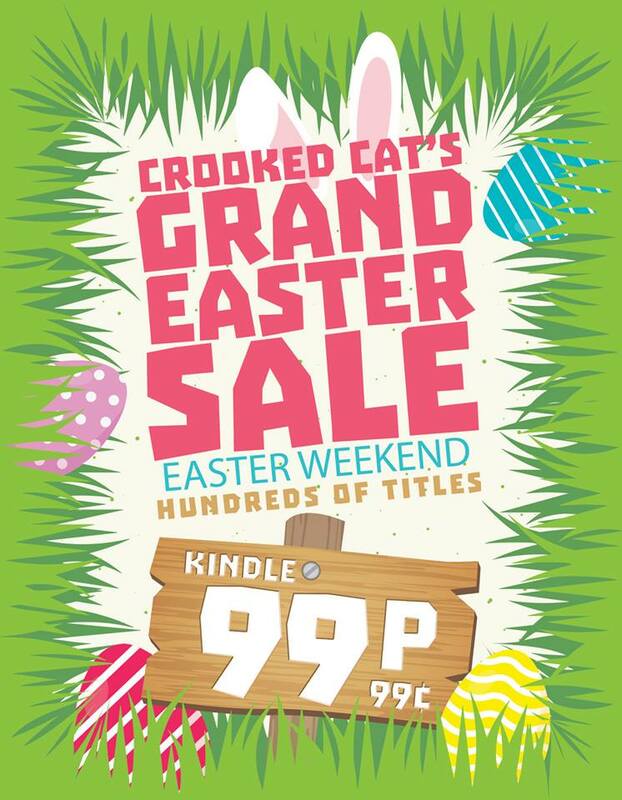 Reviewer Patricia Walker said, 'this is a gripping murder mystery that cannot be put down once you start reading'.